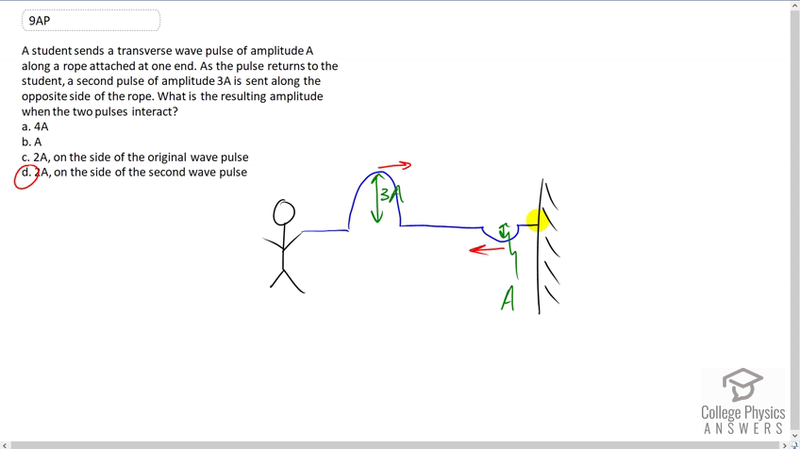 A student sends a transverse wave pulse of amplitude A along a rope attached at one enAs the pulse returns to the student, a second pulse of amplitude 3A is sent along the opposite side of the ropWhat is the resulting amplitude when the two pulses interact? This is College Physics Answers with Shaun Dychko. So we have this picture here where the student sent a pulse down a rope and it reflected off of this end where it attached to a wall. When a pulse gets reflected from a fixed end, it will go back on the opposite side of the rope. But that is not really important to know. What is important is that as the pulse is returning, the student makes another pulse of amplitude three times the first on the opposite side of the rope. And so this reflected pulse is returning on the bottom side of the rope, and so the three times amplitude pulse is going to be made on the opposite side which on this picture is atop of the rope. Now, in these two pulses are on the same spot when they interact. The Superposition Principle says to add their amplitudes. Well this one is negative A you could say because it is A downwards. And this one is three A upwards and the sum will be two A. It will be three A minus A so the answer is d. And this will be on the same side as the second wave pulse. So the second wave pulse sometime later when it's here, it will be a single pulse. It will look like a single pulse like this with an amplitude of two A.